Internet Explorer 8 Review - Why should I use IE 8 ? Microsoft shipped in its final version of Internet Explorer yesterday . IE 8 is considered a stiff response by Microsoft to its rivals . With the market share of Internet Explorer decreasing and number of rivals increasing day by day , Microsoft had to work on building something that will wow the users and turn them back to Internet Explorer .So what we have in the box with Internet Explorer 8 ? AutoComplete Address bar : Just like the latest version of Firefox and chrome browser , now IE address bar is also not just for typing the URL .It provides autocomplete functionality which will get a list of results from your History and Favorites, organized by category based on what you type.The search will be done even in the content of the previously visited pages also .The address bar can also be used to display matching websites from RSS feeds as well. Choose Tools-->Internet Options-->Content, then click the Settings button next to AutoComplete. Check the box next to Feeds, and click OK and then OK again. Now when you use the Address Bar, information from RSS feeds will be displayed as well. Group Tabbing : This is something which you might notice first when you use IE8 . IE8 has improved the way it handles tabbing . 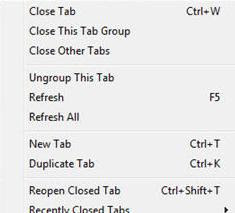 For people who love to use new tabs instead of new windows , IE8 makes your life more easier now with group tabbing . When you open a new tab from a existing page, the new tab opens directly to the right of the originating one, and both tabs are given the same color. That way, all related tabs are automatically grouped and color-coded.In firefox , you have to use colour tabs extension to achieve this.If you open one more tab from the existing page, it won't appear on immediate right of originating one like earlier . It will appear in the far right of the group with same color as of the group .You can even move a tab from one group to other by just dragging it . You can control a entire group just by right clicking on one tab and choosing the right option as shown in the figure. Tab Handling : Each tab is isolated from the others, so if one tab crashes, the entire browser won't close down. You can restore the crashed tab, and when you do, it reloads with the information that it had when its crashed, such as a partially written e-mail or a video . If its a video ,it will start playing at the point the tab has crashed .IE8 even have a new feature to reopen the closed tabs. To reopen the last tab you've closed, you press Ctrl-Shift-T. To see a list of recently opened tabs and choose which to open, you right-click any tab, select Recently Closed Tabs, and pick the one you want to open . Accelerators and Web Slices :This is the most noticeable feature in the latest version of Internet E xplorer. Accelerators are nothing but addons which will get more information on the text you have on a webpage like searching , translation , send a email ,digging the link , getting the Map of a address .... It is a kinda mashup which shows you the result of accelerator in the current page itself . Rightnow we have most of the accelerators from the microsoft such as Live Maps, Live Search and Windows Live Spaces. There are others as well, including ones from Amazon, eBay, Facebook and Yahoo. Its not tough writing a accelarator . You can do it easily with knowledge of basic XML . Web Slices offer one more way of easily getting information. They deliver information that is changing on a particular website which you are not visiting directly . For e.g if you have a website that displays latest news , you can get the news without visiting the website .When you visit a Web page that csupports slicing, the Web Slice icon on the right side of Favorites bar turns green as shown in the figure. when you click it you can see a list of Web Slices available on that page. If you select one it gets added to favourite bar. When its content changes, the title turns bold. Click the Web Slice, and it displays the content just like a live bookmark in firefox.You can click on the content to go to the web page . Improved security and privacy : The latest concept introduced by Microsoft in IE8 is InPrivate Browsing . InPrivate Browsing destroys any traces of information about your surfing activity when your web browser is closed .It means that all the cookies, temporary Internet files, browsing history, form information, and user names and passwords all vanish.You can start InPrivate Browsing by opening a new tab and selecting Browse with InPrivate or selecting it from the Safety button on the top right corner of the browser window. There is one more smart feature in IE 8 called InPrivate Filtering .Users are often not aware that some content, images, ads and analytics are being provided and shared across websites . InPrivate Filtering provides users an added level of control and choice about the information that third party websites can potentially use to track browsing activity.InPrivate Filtering is off by default and must be enabled on a per-session basis. To use this feature, select InPrivate Filtering from the Safety menu. To access and manage different filtering options for Internet Explorer 8, select InPrivate Filtering Settings from the Safety menu. To end your InPrivate Browsing session, simply close the browser window. Microsoft has even added some other safety features to IE8. It blocks the most common type of cross-site scripting attacks, and offers better protection against malicious ActiveX controls. Microsoft also claims that IE8 protects against "clickjacking " , in which a hacker can place an invisible button underneath or on top of a legitimate button and fool you into activating malicious code or making private information public. Compatibility with IE 7 websites : Sites that were built for IE 7 might now display prperly in IE 8 . To avoid compatibility issues, Microsoft designed IE 8 in such a way that the browser is set to automatically switch to Compatibility View. You'll be notified when it happens with a balloon tip which appears briefly on the tab, telling you that the browser is displaying in Compatibility View. Conclusion : So what I finally say about Microsoft latest Internet Explorer ?I can say in one line : Switch to Internet Explorer 8 . After using the browser , I did not see any big difference in speed compared to Firefox or IE7 but there is a difference in features . Most of the features are targetted at increasing the productivity of the users .I found it much better when working with AJAX applications which might be due to enhancements in forward and back navigation buttons .With a lot of features added , IE 8 is surely something to try on guys . Its fast , easy , safe and secure . Download Internet Explorer 8 Today . For more Tech world updates ,subscribe to my blog or click here to get updates via email. I installed ie8 and then came to know few software like Oracle doesn't support ie8. Then i tried to revert back to earlier version but it failed now i can't install any version of ie. Heard the same from many people. Microsoft has another software which blocks automatic upgrade to ie8. I would recommend people to go for it. I don't know why the people still using this browser, I mean there's some others with better functions, more options, and with excellent graphic interface, just watch the Google Chrome, or the famous Opera.